The Vatican has announced that the long awaited Post-Synodal Apostolic Exhortation from the 2005 meeting of the bishops which addressed the Eucharist will be out one week from today (March 13). The name of the document is Sacramentum Caritatis ("Sacrament of Love"). 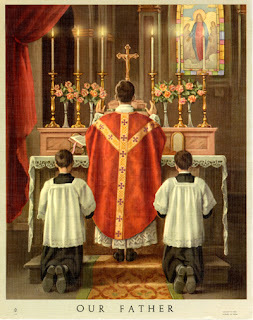 Of course, the most eagerly anticipated document is the rumored Motu Proprio in which the Pope is said to give approval to the celebration of the pre-Vatican II Tridentine Mass. One might well expect that to be released not long after this Apostolic Exhortation. Interestingly enough, March 21, the Monday of following the week, has some interesting history. Before the second Vatican Council's reform of the Roman Calendar, March 21, was the feast day of St. Benedict of Nursia. That would seem an appropriate day for Pope Benedict to release a document authorizing the celebration of the pre-Vatican II Mass. However, one could probably find other "appropriate" days (e.g., Holy Thursday), so take that with a grain of salt. Fr. Z is reporting on a letter which suggests that the Motu Proprio is going to come out before Easter. So perhaps think twice before reaching for too much salt. If the document is released prior to Holy Thursday, it would make it possible for people to experience the Easter Triduum in the Tridentine Rite. This will indeed be interesting to watch. How will the media paint it?? ?